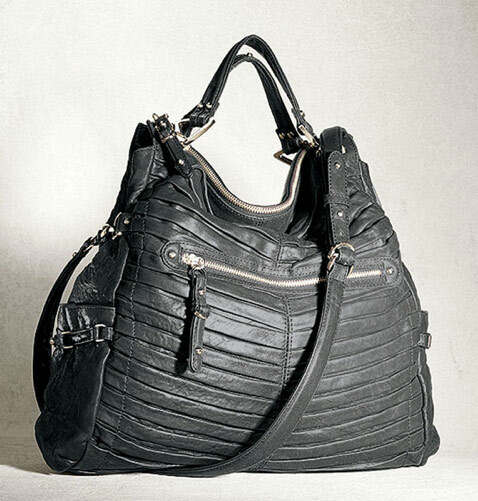 One of the best ways for a bag designer to add visual interest without subtracting functionality from a handbag is to manipulate the bag’s material to create texture within the existing structure of the design. It looks as though the fine folks at Junior Drake got the memo. The Junior Drake Mini Skinny Gail Satchel (which, incidentally, doesn’t appear to be particularly mini or skinny) is almost overtaken by parellel pleating down the front and back of the bag – the optimal word in that sentence being “almost.” The pleats create some drama without overwhelming the bag’s shape or practicality, which is just about as much as you can ask from a design with this much texture. If anything detracts from this overall design, it’s the somewhat predictable shape and structure. I would have preferred to see a little more creativity in the final product, but for someone that likes a simple, traditional shape, this certainly isn’t a bad option for a neutral bag with some pizzazz. Buy through Nordstrom for $398.